Last year, Nova Southeastern University received its largest philanthropic gift in history from Tampa-area cardiologist Dr. Kiran C. Patel and his wife, pediatrition Dr. Pallavi Patel. The commitment from the Patel Family Foundation includes a $50 million gift and an additional $150 million real estate facility investment in an upcoming 325,000 square-foot medical education complex that will be part of NSU’s new Tampa Bay Regional Campus in Clearwater. With more than a dozen permits issued for the project by the city of Clearwater, the site has been cleared and the exterior walls are now up for the future home of the new Tampa Bay campus. The complex will house the Dr. Kiran C. Patel College of Osteopathic Medicine and the Dr. Pallavi Patel College of Health Care Sciences, as well as the Ron and Kathy Assaf College of Nursing, Fischler College of Education and the College of Psychology. The project is estimated to be completed by mid-2019. 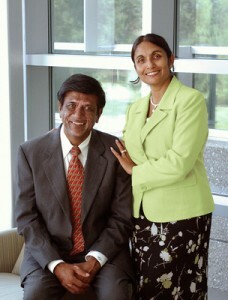 Dr. Kiran C. Patel & Dr. Pallavi Patel.